Champagne is one of popular sparkling wines used in occasions of celebrations. Whenever I come across champagne, it reminds me of many good and happy moments. As a matter of fact, it’s seldom used in home cooking. Often times, I like to break the rule of cooking by adding some extraordinary ingredients into an ordinary dish to impress my family. 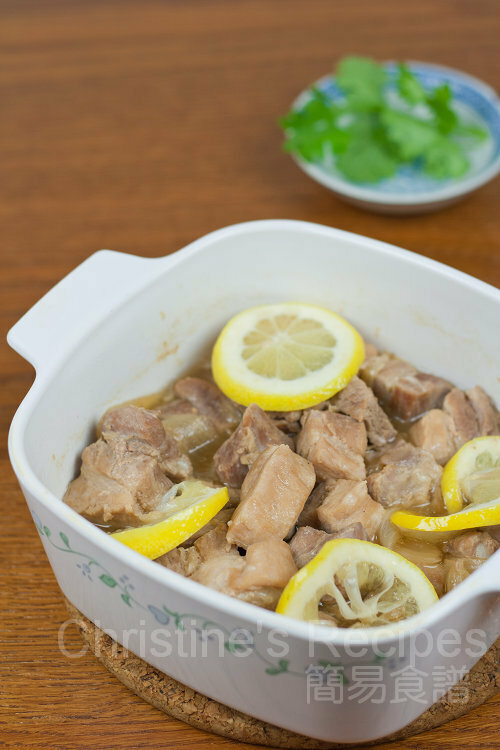 Here comes a humble dish of pork rib stew infused by the sweet fragrance of champagne, with a bit of subtle sourness of lemon. 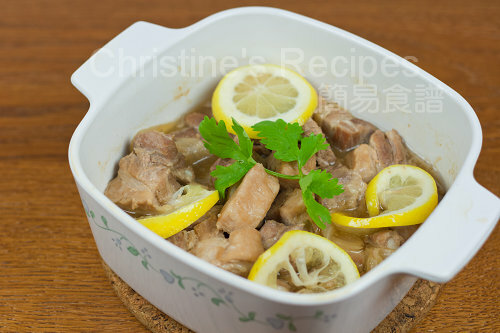 You might have tried the popular Chinese dish, lemon chicken before. Would you like to try this new creation? Rinse and wipe dry pork ribs, chop into chunks and mix with marinade well for about 30 minutes. Heat 2 tablespoons of oil in a hotpot (or wok). Add shallot and saute until aromatic. Be sure not to burn it. Add pork ribs and stir fry until colour changed. Pour seasoning over pork ribs, cook until sauce reduces by half. Add lemon slices, continue to cook for a while. Serve hot. Garnish with coriander (cilantro) if you like. The champagne helps tenderize the pork ribs and produces soft and juicy texture. And it goes really well with lemon. This is a new way to serve pork ribs, at least in my household. I could almost smell the lemon aroma. You're such a talented cook Christine! Who would have thought o combining lemon and champagne. And I love that champagne helps tenderize the meat oh so naturally without the need of powdered preservatives to help tenderize it. Hi Christine! What a fantastic idea - I can't think of a better way to splurge on the people you love! I will have to try it one day! Ooo, I love the addition of champagne, fantastic! Beautiful use of champagne in cooking. Looks very delicious. Must be full of flavour. This sounds like a fab combo! Have to try this soon! Great idea! Every day should be a celebration so champagne can be a part of it. That dish looks luscious! Wah! Champagne huh? Going classy. I must give this a go. I have never used champagne in dishes before. lemon and bubbly how amazing!! That champagne must be making this stew exceptionally tasty! Red meat stewed in Champagne! I mean....wow....the nerves of the tongue and palate would be elevated utterly and rapturously! Wow, pork and champagne, this is a new one for me, what a wonderful sounding dish - cannot wait to try! I have never tried such combination. Sounds like a great idea! Thank you very much for this delicious recipe!! Just wonderful! Hi Christine, sorry if it might seemed like a silly question but is it ok for children to eat this dish as it contains alcohol? The alcohol will be boiled away, just the flavours will be left behind. If you're still worried, simply skip the baby champagne.